I know many players who take backgammon seriously. By this I mean they really care about improving their game and they want to play at the highest level they can. By the way, I consider myself to be in that category. What I find really interesting is that some people in this category are clearly getting better year after year, while others don't seem to be making much progress at all. Of course, part of the difference between these two categories of players is that the ones who are really improving just might be more skillful at games or simply might be smarter. But after giving this a lot of thought and after discussing this with some of the world's best players, I believe there are two other factors that contribute greatly to a person's ability to improve: proper strategies, and proper attitude. I don't care how much you play or study this game, unless you employ strategies that will truly help you remember and internalize information in a way that will stay with you, looking at positions in the computer and reading books about backgammon won't be any more educational than a cat watching TV. You don't improve by looking at positions and trying to memorize the right move. That works for opening moves, and maybe even the second move of the game. I can tell you, from memory, every opening move and what the proper response would be on the second roll with every combination of rolls after the opening move. It is possible to memorize, from study and repetition, early game moves and many "reference positions." But that's not learning...that's memorizing. When you memorize, you are nothing more than a robot moving the pieces. The right way to learn is to take the time to understand why each move is the best move--why you win more games or more gammons with one play over another. Why you make one move at one score and another move at another score. When you understand why, not only will you be more likely to make the right play in the future, but you'll be able to make more right plays in similar situations that you haven't studied before. There are simply too many variations of positions and match score situations for anyone to simply memorize what to do in every situation. You must combine reasoning with everything you learn. Some might say this process takes far too long. Just the opposite is true. Learning something right the first time, and internalizing it, is far less time (and pain) that trying to relearn it over and over and over again as you make the same mistakes over and over and over again. When I discuss a difficult play with one of the top players in the world, he doesn't say that play A is better than play B simply because you win more games that way. He is able to explain why you win more games that way. It's the why that is the key, and many of us simply look at the rollout results and see what play is better without thinking about why one play ends up with more wins or gammons than another play. So the first key to proper strategy is to understand the why of every situation. Another element of learning strategy that I think is key is to attack this game in segments. You can't really learn much by simply playing games and trying to figure out what went wrong. You have to study the game in small bites to be able to internalize and know and remember what you've learned. 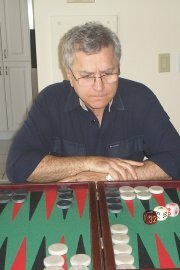 For example, I do not play games and matches with student in order to teach them backgammon strategy. There are just too many things that come up in one game to try to learn everything. I start out with the opening game strategy...the opening moves and what moves are best and why. Then we might study only the odds...the odds of rolling different combinations of numbers, the odds of getting hit, the odds of winning and getting gammoned etc. Then we study, separately and completely, match equity and cube strategies. Then we might study bearing in, and then bearing off. I have broken the game down into 24 segments. By breaking the game down to its parts and studying each separately, and discussing what to do with every roll and every match score, the lesson is much more likely to be remembered and internalized. And the student is much more able to understand why each decision is better. In the last 5 years a good friend of mine by the name of David Rockwell took his game from an average Open Level player to a Top Open Level Player, and his tournament results and match play results proved it. David has been playing for years, so why was there so much improvement recently? There is no question that part of the reason is that he is very talented and intelligent, and that recently he simply made his mind up to take the time and effort to raise the level of his game. But a major reason for his improvement is the strategies he employed to raise his game. David not only played a lot of matches against Snowie and analyzed his errors and studied them, but he broke down his errors in to categories so that he could determine exactly where his weaknesses were. By doing this, he could concentrate on exactly where he needed to improve. David had his own method of breaking down the game into bits. It was not enough for David to know that he was making X percent of checker play errors. He determined exactly what kind of checker play errors he was making. Was he hitting too much or too little? Was he failing to attack enough to win gammons? Was he failing to slot points or slotting too much? Was he making mistakes bearing off? Will you permit me to read your mind? You are thinking, this is really laborious work! This is drudgery! This is not fun! And you are right. You are right only if you think that way. But for David it was fun. It was fun to really find out where his weaknesses were, and to study them, and to see improvement over time as a result of that study. And it was fun to start seeing his Snowie ratings improving. And it was fun to start winning more matches and tournaments. And it was fun to become respected as a top player. When I started categorizing my own mistakes, I found several thematic weaknesses in my game. I am far from perfect in those areas now, but I certainly am much better. For example, I had a tendency to avoid coming out to my opponent's bar when I should. I had a tendency to try to make primes when I should have been blitzing, and I had a tendency to double too late when my opponent was 2-away. Simply identifying those areas as weaknesses helped my game, but I also studied the positions where I failed to make the right play, moved checkers around to see when the strategy changes, and I am clearly much stronger in those three areas now. If you don't have the attitude that learning and study is enjoyable, you either won't do it at all, or you won't do it very long. Personally, I find the exercise of learning as much or more fun than actually playing the game. I'd rather spend an hour with one of the top players in the world explaining his thinking and reasoning to me about a play or position than an hour playing backgammon. The most exciting things to me are when I have one of those "AHA!!" moments when I realize something about the strategy of the game I did not previously understand before. There is another element of attitude that a World Class player by the name of Bob Zavoral point out to me recently. Ego. Many times our ego gets in the way of our ability to improve. Our ego may stop us from questioning our own thinking and decisions. Our ego might make us refuse to believe that we have been doing something wrong for many years and should think about a change that might improve an element of our game. Our ego might keep us from considering the opinions of others that we might think are not as smart or skilled as we are, but they could be very right about a given situation. Ego and attitude not only apply to the learning process, but carry over to your skills over the board. Sometimes your ego gets you into big trouble over the board and keeps you form making the right decisions even though, intellectually, you could come up with the right decision if you were able to study the situation unemotionally. So, do you want to be one of those players who plays at the same level year after year after year? Do you want to be an Intermediate or low-open player forever, with little chance of ever advancing? Or do you want to experience the joy of seeing your game improve year after year? Not all of us can become World Class players simply because we have the right strategies and attitude, but ALL OF US can get better and better and enjoy the game more. More than anything, the key is approaching study and improvement NOT from the standpoint of the end results you will achieve, but simply because the process itself is enjoyable.